I went to high school with Tony and think it is great what you guys are doing. I have thought about adopting my entire life but am know just starting to really look into it. I have to say that I am overwhelmed at the least. My husband and I have two boys of our own, Grady (3 1/2) and Jackson (1), and we have started talking about adopting a little girl. I was wondering if you could give me some information on where to start, how long the process usually takes, costs involved, thing of that nature. I was just talking to Haley Gray and she said that I should contact you. My husband and I are interested in adopting from DRC. We have two daughters who were born in Uganda but this time it is time to adopt a boy, a brother for our family!! We are super excited and Haley said I should talk to you to learn more about what you know about the Congo. We did not use an agency last time so I am use to doing research and I am always so excited to meet new people who are in love with adoption as much as we are!! Sheena Broek and I were with the same adoption agency. My husband and I are still there but have lost all faith in them:/ We begun this process over 2 years ago and have been on our agencys wait list for 10 months now. We are next for a little boy under 18 months, but we are really dicouraged and we don’t feel any closer. We need help and have no idea what to do:( I just wanted to know if you had any words of advice or wisdom you could share? It was so nice to talk to you the other day Amanda! I’d love to talk to someone. We are just starting and are overhwelemed and someone mentioned this site…. I am just learning of your efforts in the Congo and more specifically at Emmanuel Center. I am over joyed to find any information about this orphanage as our daughter Miriam is there!!!! We will more than likely leave the beginning of March to go get her. I looked through your pictures but could not spot her. Our agency has been “sparing” to say the least with pics of Miriam so we are hungry for pics and any information about her. I wish I had known of your efforts for Christmas. Please let me know what else you have coming up as I would love to come along side of you. My husband and I are wanting to adopt. We have 3 children, ages 14, 15, and 17, and they are incredible blessings to us. Over the past several months, the Lord has been asking us to open our home to more. We have more love to give, and we want to invest in the life of a child. We assumed the Lord was leading us to adopt domestically through the foster care system because although we are comfortable we have very little “extra” money to pay for an international adoption. For some unknown reason I was attracted to the DRC and began googling information about adoption specifically from this country. That’s when I stumbled onto your website. I know our child is waiting somewhere out there for us. Now I am wondering if our child is currently living in the DRC. Thank you for the work you do! May God bless you over and over for taking care of “the least of these.” When you have the time I would love to hear about how we get started with the process of adopting. 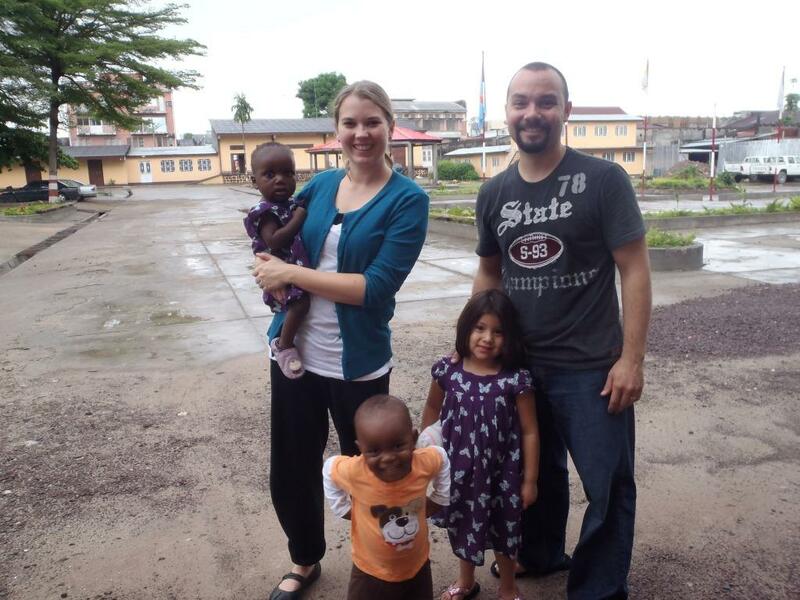 My husband and I have been to Tanzania, Africa to help build an orphanage. We both have fallen in love with the people there…we truly feel as if we left a piece of our hearts in African. We have been forever changed. I am thoroughly touched by this site. I am ashamed at how little I have been aware of what’s happening in the Congo. It’s only been through adoption searches that I have grown to understand the tragedy of this country and its people. Depraved indifference. My husband and I have two biological children but have also always known we would adopt. Now is the time and Congo is the place. My understanding is that independent adoptions are becoming illegal in the DRC in 2014? I’ve researched some agencies …wondering if you have any advice. Yes independent Adoptions have come to an end for all countries. Do you research and follow your heart 🙂 Good luck to your family. It’s Bobby from the Paris-NY flight. Just wanted to say hello and remind you to email me! I’m excited to spread the word about your work and figure out some ways I can help spread awareness, etc. It was so mice to talk with you on the flight!!!! As you can see I am a little behind in my blogging 🙂 I would love to hear any ideas you may have!!!! My husband and I are very interested in adopting from Congo. We have heard good things about Wren’s Song. My question is, if we started an independent adoption and it was still in process by June 2014, would we be forced to go through an agency and pay a lot more money, or would we be able to continue on our independent track? How long would an independent adoption take with your help (approximately)? Thanks for all you do to help needy children find loving homes! You are truly inspirational, Sarah! I would love to work with you on our adoption. I sent you an e-mail and hope to hear back soon! Blessings to you and your family! Sarah, I live in Douglas and after reading your story in the Douglas Budget I am so impressed by what you have done to help these children. I would like to send you a check if you will give me your address or let me know where to drop it off at. What an amazing thing you are doing. I have been so inspired by your blog. You are so brave and amazing and are so doing the work we were born to do. I have read it over and over. My husband and I feel the calling to adopt from the Congo. We would like to get started right away to end suffering for at least a few children. Can you help us? We live in southeast Montana, pretty close to Sheridan and would love to come to see you guys in Douglas. We would love to come soon, like Friday, Saturday, or Sunday or as soon as possible. We wouldn’t want to overwhelm you so wouldn’t stay long. We would love to talk with you. My husband and I have been married two years, we’ve began the process of adoption but we have some questions. After we get approval are we able to adopt with a marriage less than the required 5 years? Can we adopt a child without the use of an adoption agency? Do you know any good lawyers in the DRC? Thank you for sharing your journey with us. I would like to learn how to help. I have two young children with more toys and clothes than I know what to do with. I would like to start by sending some appropriate supplies directly to the orphanages. Is this possible to do? I am unable to find any direct addresses. Would you be able to send me the address to an orphanage in need and maybe some ideas for supplies that are needed. I will also speak to my husband about donating to your fund. I think that the chickens and gardens are amazing and will provide for many children. Thank you and God Bless you.